Are you having a tough time this Christmas season picking out the perfect gift for that special someone that has everything? 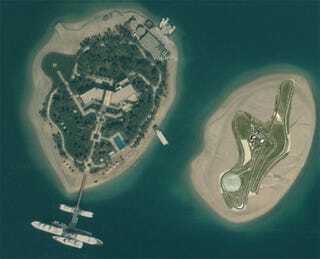 Well, instead of heading down to the local Neiman Marcus store, or even buying a mere skyscraper, Dubai’s crown prince bought the retired Michael Schumacher his own island. Dubai’s crown prince, Sheikh Mohammed bin Rashid Al Maktoum (phew! ), bought the former F1 star his own piece of "The World." Situated off the coast of the United Arab Emirates, "The World" is a grouping of man-made islands developed to look like a map of the Earth. Valued at roughly $7 million, Schumacher’s island will be located in the southern hemisphere, part of the "Antarctica" island cluster, when completed in a few years, presumably before the Michael Schumacher World Champion Tower in Abu Dhabi is completed.